Rood: “If the U.S. pursues a space sensor layer, it watches, it detects what others are doing. It’s not a provocative act." WASHINGTON — The Pentagon is moving forward with plans to build a constellation of warning satellites to defend the United States and allies from missile attacks. Congress also directed the Pentagon to study the possibility of deploying weapons in space to shoot down enemy missiles. 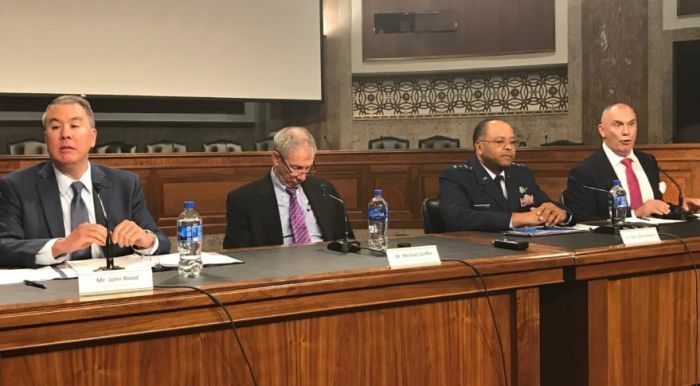 A decision on whether the United States should deploy defensive weapons in space is “some time away given the level of examination” that is required, Rood said. Congress is directing the Pentagon to step up efforts to develop a space-based missile shield at an especially sensitive time for space security. The Trump administration has warned that the United States could see its dominance in space challenged by China and Russia. As countries develop new “counter space” technologies and space becomes militarized, the administration argues, the United States needs to strengthen its capabilities to deter attacks, and also be prepared to fight back. Arms control experts and watchdog groups have warned against an escalating space arms race but the U.S. government contends it is taking only defensive measures. The Pentagon has been particularly alarmed by advances in China’s and Russia’s hypersonic weapons, which are not detectable by current U.S. missile-defense radars. Hypersonic glide vehicles fly into outer space and back into the atmosphere in unpredictable trajectories, unlike ballistic missiles. The Defense Department concluded that only sensors in space can spot these threats accurately and early enough so they can be shot down. There are still “strategic and policy questions that need to be answered,” said Rood. Griffin also believes the United States should have its own offensive hypersonic strike weapons. The Pentagon has awarded Lockheed Martin a billion dollars worth of contracts to develop hypersonic missiles. Griffin said the United States’ military dominance is being challenged and the nation has to step up its space and missile defense capabilities. “Policy is not my thing,” he noted. “We have to go to space both for the sensor layer and the ability to project power,” he said. Griffin fired back at critics who estimated a space-based missile shield would cost $100 billion. “I am very tired of people saying we cannot afford it,” he said. He estimated that based on rough costs of $20,000 per kg, a layer of 1,000 interceptors each weighing 1,000 kg would cost $20 billion. “We’ve paid a lot more and gotten a lot less in the Defense Department,” Griffin said. The director of the Missile Defense Agency, Lt. Gen. Samuel Greaves, said he expects decisions to be made later this year on the architecture for a space-based sensor layer for hypersonic defense. Several industry proposals are being evaluated, as well as a concept developed by the Defense Advanced Research Projects Agency. DARPA is developing an experimental constellation of commercial satellite buses in low-Earth orbit that would serve as platforms for military sensors.